This quilt is finally finished a double wedding ring quilt made mostly from scraps. I love the look of this quilt and the total scrappy look. A closer look at the quilt and the corners which are the yellow and blue triangles. I bought these two colors and the white for the background. 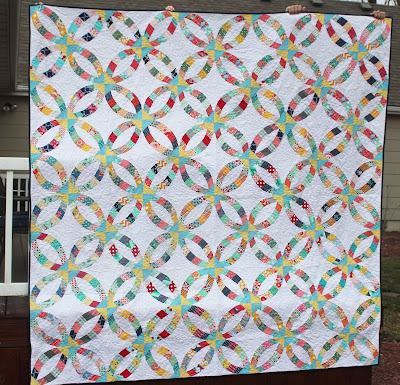 The pattern is Metro Rings from Sew Kind of Wonderful and it uses the quick curve ruler. The idea of the ruler and the pattern is ingenious and I was very impressed with the product. How do people think of these great ideas? I mean the idea of this ruler with so many ways to measure and cut the various pieces, it is amazing. My monthly quilt club used the quick curve ruler for our quilting project with most of the club making the Curve it Up pattern (a sampler). You do have to be very careful with the ruler and line the ruler up in the same place each time. I figured this out about mid-way in the construction, so some of my blocks don't line up perfectly. The quilt club all commented about this and said this wasn't an exact piecing but did allow for a good finished project. 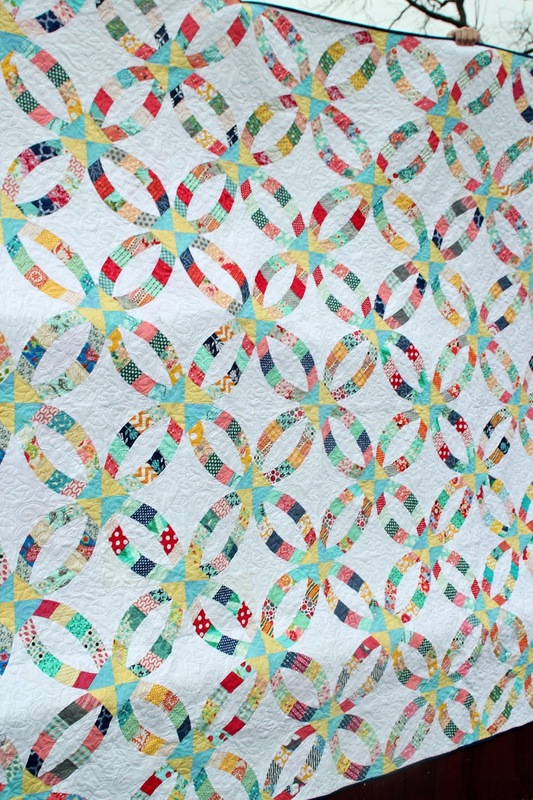 My quilts do go to a longarm quilter and she does beautiful work. Here is a closer view of the blocks and you can see the pattern. I cut 4 arches from each set of 5 strips. I liked to balance the arches with the same set of fabric and then use the pairs of arches opposite of each other. This quilt took almost one year to complete and I really didn't want to make it queen size. Meredith encouraged me to make it large enough for a queen bed and I am happy she did. It is just too pretty not to have for a bed but I did grumble quite a bit while making the last 5 blocks!! On a personal note you might notice a few more quilts on the blog this year along with a bit of a blogging absence at the first of the year. This can be explained by a loss of a loved one, a family member gone too soon. It was such a sad loss for our family and for my husband. This loss is hard and sad and reminds me that life is so precious and God has a plan. This loss was a reminder of my mortality and I decided it was time to stop buying quilting fabric and sew up some of this fabric. After all, my daughters would rather have a finished quilt than a box of fabric. Or I like to think they would. On Mondays, my local Pfaff dealer has open sewing day. 10 am to 9 pm. I can get there around 3 pm and it is amazing how much you can get accomplished. Sewing is a solitude activity for the most part and after the loss, I also decided to get out and do more things. The ladies at this sewing night are good friends and we laugh and share our lives. So with one night a week dedicated to sewing on quilts, I will have more to show here. This was my third week and I have finished two quilts, I will just have to send these slowly to the longarm quilter, this will help with the quilting expense. I am not saying garments are going by the wayside, not at all. Garment sewing is my first love and I love having new clothes. I am just going to make an effort to spend time sewing with friends and making beautiful quilts. Lori, love your quilt. It's gorgeous and brings back great memories. My maternal grandmother made this quilt pattern when I was a cild. She used scraps of fabrics from my sister's and my sewn garments. It's one of my favorite things. Thank you so much, I bet that quilt from your grandmother is a favorite, so many memories. I understand about the spending time with your quilting friends. 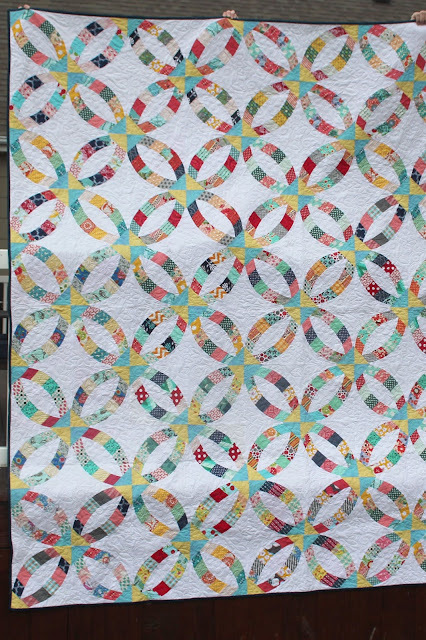 I know I treasure the quilts my Grandmother made and I'm sure your daughters will treasure theirs! Thanks so much, Carolyn, these friendships with these women are amazing. This quilt is lovely. You did such an impressive job of using scraps. I looked closely and didn't see any piecing problems. I'm going to check out those rulers. Yes, life is precious. I'm sorry for your loss. You seem to be handling it in a positive manner. Thank you, Rose, it sure felt good to lighten up the scrap drawers! I appreciate your words and I am learning from his widow, she is an inspiration. Thanks, Kathy, I appreciate it. Yes, do savor the moments, they will all be gone before you know it. Thanks for the hug and the kind words. Beautiful quilt Lori, and such a great reminder to us all that life is indeed short, enjoy spending time with those you love and hold dear, and get those pieces of fabric made up into quilts to leave a legacy for our kids and grandkids. Prayers for your family as you continue to grieve. Thanks, Lisa, we do need to hold people dear and tell them that, too. We appreciate the prayers. This quilt pattern is on my bucket list. Yours is beautiful! Thanks, Cindy, the rulers make it much easier to make. There are many more quilters around and quilting events to participate. The garment sewing is such a big online community, maybe it will trickle down to brick and mortar stores. Thanks for your sympathy and kind words, it is appreciated. Lori, your quilt is beautifully done. I get what you said in your notation. I am also working on putting my collective stash to use as I contemplate my own mortality. It is oh so difficult to keep from purchasing colorful prints that tempt my quilter's palate, and collecting new patterns which inspire. It's all so much fun and oh so Zen, so I just keep on doing it all. Love your blog! So happy you like the blog and I appreciate your comments. Your quilt is beautiful! I'm sorry to hear about your loss. I am sorry for your loss. Sewing is a solitary endeavor most of the time. I enjoy quilting retreats held in stores but my local stores only hold them once a month on Saturdays. One even quit doing that due to lack of interest. I wish I had somewhere to go every Monday night after work - that would be awesome. Congratulations on the finish. Thank you, Lisa. My local store has this open sewing on Mondays, Fridays and some Saturdays. Your quilt is so beautiful. The ruler designers did a presentation at my Bernina store & your quilt could be in their book ! I'm so sorry for the loss of your family member. It's sometimes difficult to understand Gods plan . 2012 was the year for me - I lost4 family members . Sewing kept me grounded . Thanks for the reminder to live each day & enjoy those around us !! Sending Love & Prayers to you & your family . Thank you, Mary Ellen. I cannot imagine your pain with the loss of 4 family members, you are right sewing is therapy. Thanks for the love and prayers. I'm sorry you've dealt with the death of someone dear. It sounds as if you are handling it positively, however. I once did similar and I no longer "save" anything. If it's lovely and I like it, I don't save it for holidays. If it's good, I eat it. If it's fun, I do it. If I love someone, I tell them. Life is so short and as a nurse I saw how very fragile way too often. You enjoy your friends and sewing those beautiful quilts and we will enjoy seeing them! Hugs sweet Lori! You are right we need to use our things and not save them. Meredith is studying nursing and she is reminded about fragile life. Thanks so much. I am very sorry for your loss and am grateful that you would share it so beautifully with your readers. You have inspired me before and continue to do so in your words about using what you have. I love this quilt and have been planning a quilt with a lot of white and without a border for my own bed. 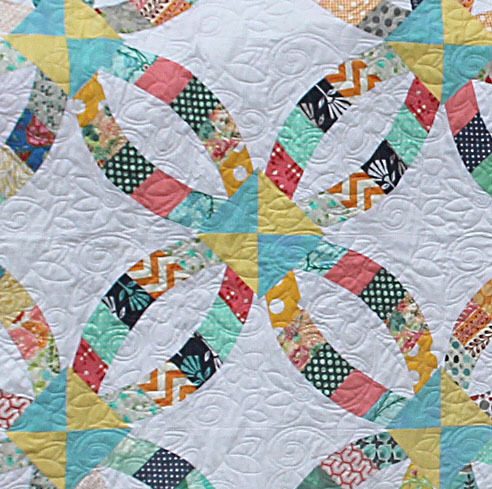 Quilting can be a great palate cleanser between garments. Oh, thank you, Anna, I appreciate your kind words very much. I agree quilting is a palate cleanser and something soothing about the steady stitching of fabric. I'm so sorry for your family's loss. 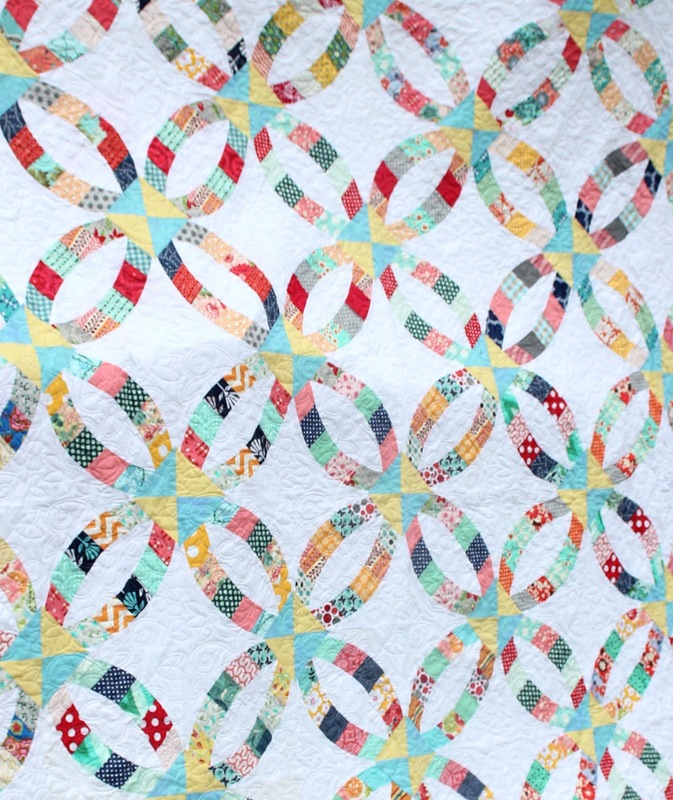 This quilt is beautiful and I think quilting with friends will be a good outlet. We'll enjoy seeing your finished works too. Thank you, Mary Sarah. The group of ladies is such fun and helps the soul! Lori, I'm so sorry for the loss you and your family experienced. Your thoughts are beautifully expressed. 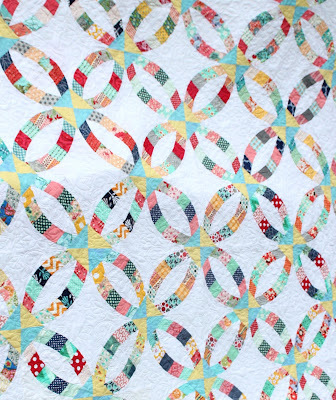 As you finish each quilt imagine they're a big hug, wrapping the lucky recipient in love. My best wishes for you, and thank you for all time and effort you put into sharing your work with us. I'm so sorry for your loss. You guys will be in my thoughts and prayers. And I know that your quilts will be treasured for a long time. I have several quilts that my mom made for me as well as one made by Blake's grandma and one by my great-grandma. They're so dear to us! Lori, I am so sorry for your loss. I love your blog, your beautiful creations, and your thoughts (which are always worth reading). Thank you for the reminder that time is precious and fleeting.